Parsons: "Colours a little eye-jarring, but overall very nice design." Parsons gives it an "A", 85/100. Wow. This was never a good idea, either graphically or symbolically. I remember even as a child thinking that this was an exceptionally lame flag concept; from a grown-up perspective, apartheid-era posturing aside, it really trumpets "our state has no coherent national identity!" ...which is not really what you want from your patriotic symbolism. 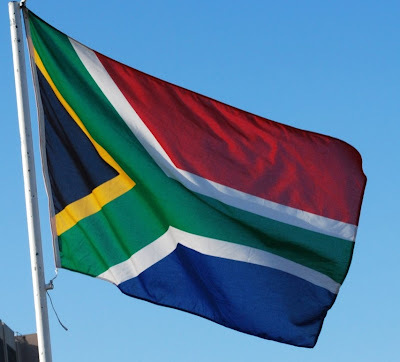 So: South African flag = huge, HUGE improvement, but I do wish they'd gone for all white on the stripelets. Parsons: "Looks good on a T-shirt, not on a flag." It's rated "Too busy," and gets a "C+", 60/100. 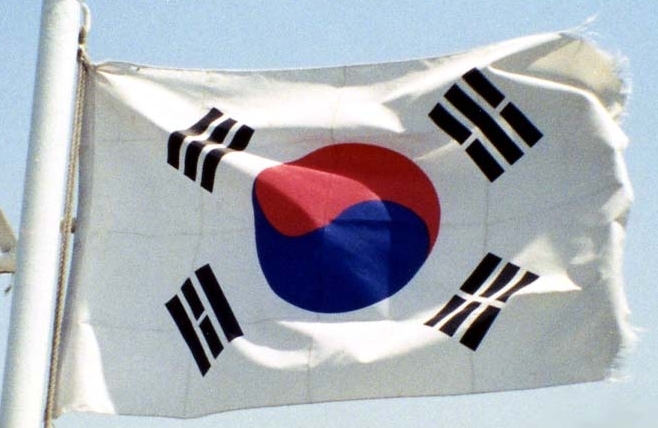 Michael5000: The South Korean flag is one of the most visually distinctive and identifiable flags on the planet. It takes the overflagged colors of red, white, and blue and does something really new with them, and it is one of only a small handful of banners that successfully marries non-Western symbolism with the European flag tradition. I can't speak for how it would look on a T-shirt, but it sure looks great on a flag. 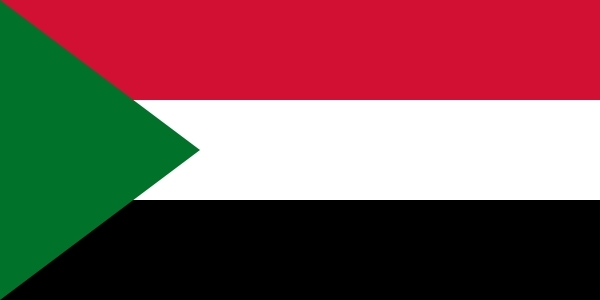 Parsons: Parsons didn't have anything to say about the flag of South Sudan, as the country of South Sudan was still several years in the future. Michael5000: The L&TM5K welcomes South Sudan, two days shy of three months old, to the family of nations! And complements it on a nice flag! It is similar to the South African flag in palette and overall shape, but with a somewhat more traditional construction. And see how nice those white stripelets are? I'd like to do a side-by-side taste test of the actual flag vs. the same design with a white star, but I suppose the world's newest state has more important things to do than endure my second guessing. Good luck, guys! 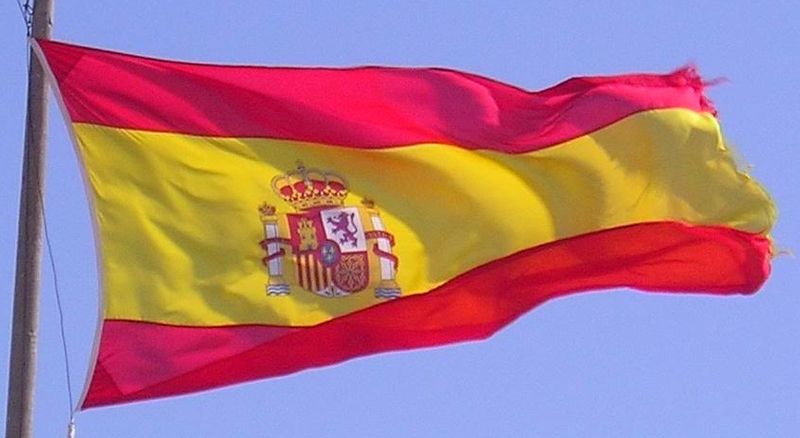 Parsons: "Spain had a civil war over whether to keep this flag," says Parsons. "The wrong side won." With "graven images," it gets a "B-", 65/100. Michael5000: Spain, much like many of the countries of Latin America -- coincidence? -- has both a state flag and a civil flag in circulation, the state flag being the civil flag overlain with some old-school heraldic frimframery. But! As far as I can tell from the photographic evidence abundant on these here internets (and from a short paper, "Spain," that I wrote in my youth at the encouragement of my sixth-grade teacher) it is the more complex state flag that is by far the dominant choice. The colors are very distinctive and visible, and the horizontal stripes have a simple but unusual 1:2:1 width ratio that I like. There's no getting around the fussiness of the pillars 'n' shield 'n' crown device, but I will waffle a little on my principles and not that the flag of Spain shares a certain very old school Iberian je ne sais quoi with the flag of Portugal; both countries profit by getting the action poleward of dead center. Yeah, I can't help but like the flag of Spain. Parsons: "They probably thought it looked 'hip' in the 70s." Disliking "weapons," "bad colours," "graven images," and that it's "too busy," he gives it a "D", 41/100. Michael5000: It's entirely possible that they thought it looked 'hip' in the 1970s, as the colors it employs were indeed fashionable in that decade. 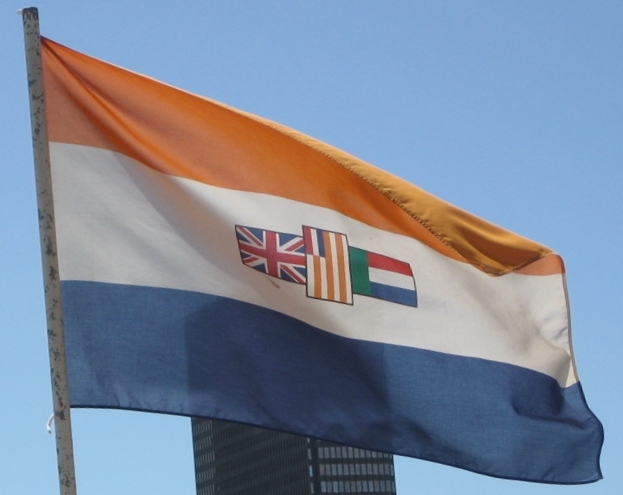 The remark is rather off the point, however, as this flag was adopted in essentially its modern form in 1950. As a 1:2 flag it's a bit long for my taste, but that prejudice has faded a little over the course of our long journey through the flags. 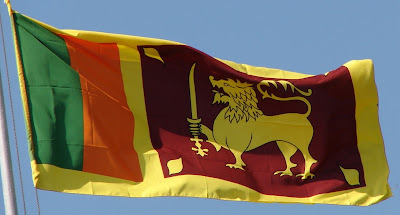 Sri Lanka's is a highly distinctive and immediately recognizable flag and, like South Korea, Sri Lanka brings some serious local symbolism to its banner. That lion is 2500 years old, y'all. And, for all that he is not a simple geometric graphic element, he is on the other hand just a single-color silkscreen or applique. It's not like we've got the state seal of New York on there. The flag of Sri Lanka: I like it. Parsons: Without comment, it gets a "B", 70/100. Michael5000: Rump Sudan has a perfectly serviceable flag, but it's a bit on the drab side next to the new southern neighbor's. I think the South Korean flag is awesome as a flag *and* as a T-shirt! Also - I'm happy to see that the Life & Times has officially recognized South Sudan! And it is a pretty good flag too! South Korea: I might have fimbriated the Yin-Yang, but I agree with everything that has been said. A. 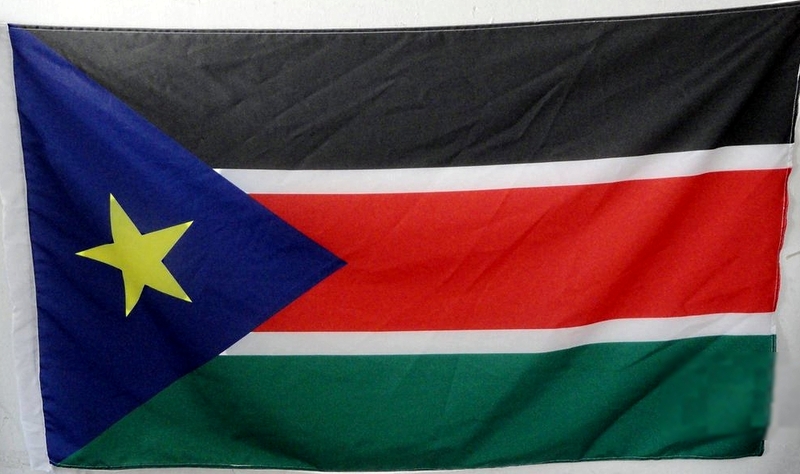 South Sudan: Welcome, even if I don't like the country's unoriginal name. 6 colors. Whew. ALL 6 major flag colors, actually. The blue tends to blend into the black and green, as well. definitely should have made the fimbriation and the star match, and fimbriate the triangle, I'm thinking. It's certainly serviceable, but has some definite room for improvement. Still, it's lively, and far from horrible. B.
Spain: Frim-frammery or no, it certainly works it. And by my rule of seals, it is still Spain without the seal. Nice flying version here. Plus, its used in the civil format quite effectively for internet language icons. In fact, when put next to most of Europe, it stands apart very well (I'm talking about you, Italy/Ireland/France and Slavic countries.) A to A-.